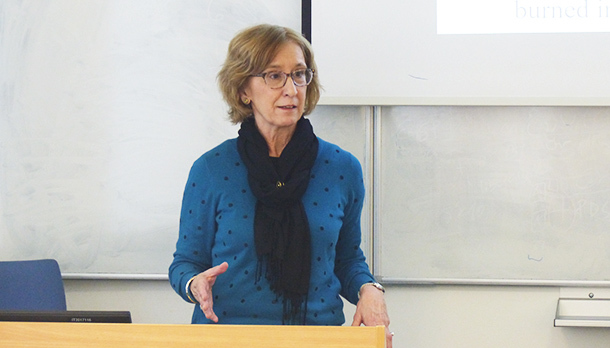 On Friday April 5th, 2019, Dr. Kathleen Wickham was invited by Empire State College to give a special lecture at the University of New York in Prague on the theme of human rights and the role of the media in historical context. Dr. Wickham, currently serving as “Chair of the Americas” at the University of Rennes in Brittany, France, is a professor of journalism at The University of Mississippi where she teaches Advanced Reporting, Media Ethics and Press Coverage of Civil Rights. She previously taught at The University of Memphis and worked as a reporter at the Newark (N.J.) Star-Ledger and Atlantic City (N.J.) Press. Dr. Wickham was accompanied by her publisher Lawrence Wells, who also contributed to the presentation. Dr. Wickham’s lecture drew heavily on her research conducted for her latest book entitled, ‘We Believed We were Immortal: Twelve Reporters who Covered the 1962 Integration Crisis at Ole Miss.’ She compared and contrasted the role of the local, regional, and national media in covering the crisis surrounding the enrollment of the first African American student at the University of Mississippi in 1962. A diverse group of students and professors attended the lecture, and a lively debate followed, covering a broad range of themes ranging from incentives of the news media, the initiators of the civil rights movement, and the power of the image in transforming public opinion.